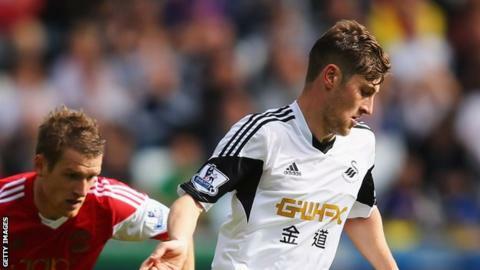 Swansea City players will be happy if head coach Garry Monk is appointed manager, according to defender Ben Davies. Monk is expected to meet the Swans' board this week, with an announcement due before the end of the season. The former captain was put in charge "for the foreseeable future" after Michael Laudrup was sacked in February. "I think the players will be happy to see him get the job," said Wales international Davies. Swansea lost their last home game of the season 1-0 against Southampton at the Liberty Stadium on Saturday, conceding a goal in injury time. However, the Swans secured top-flight survival when they beat Aston Villa 4-1 at the Liberty Stadium on 26 April. It means the Welsh club will be playing in the Premier League for a fourth consecutive season in 2014-15, with Monk guiding them to safety. But the season proved difficult following on from the Capital One Cup win and top-10 finish in 2012-13. Davies says he is disappointed that the team could not deliver a win against Southampton to help Monk's bid to become manager. "I think he's done great for us since he's been here," said Davies. "The performances have been good and it's unfortunate that we couldn't win for him." Davies says Monk has all the right attributes to succeed if given the chance. "He's a really good motivator," said Davies. "His tactics are very good and it's difficult for someone to come in and do as well as he's done. "All the players are working 100% for him and it's showing on the field. "He's kept us up and that was the main job that he was brought in to do." The Wales international says he feels that Monk is the right man to take the club forward. "I think over the summer, if he does get the job, he'll be able to sit down and have the bit of time that he hasn't really had to analyse players and decide where we want to move forward and in which way we can."